Dubai, the largest and most populous city in the United Arab Emirates, is one of the latest municipalities to adopt Bigbelly's world leading smart waste and recycling management solution. With stations deployed in the areas surrounding the main corridor of Sheikh Zayed Road, the Bigbelly system offers a completely contained design to remove visible waste, sustainable technology that reduces the Dubai's environmental footprint, and recycling stream for easy waste separation on-the-go. 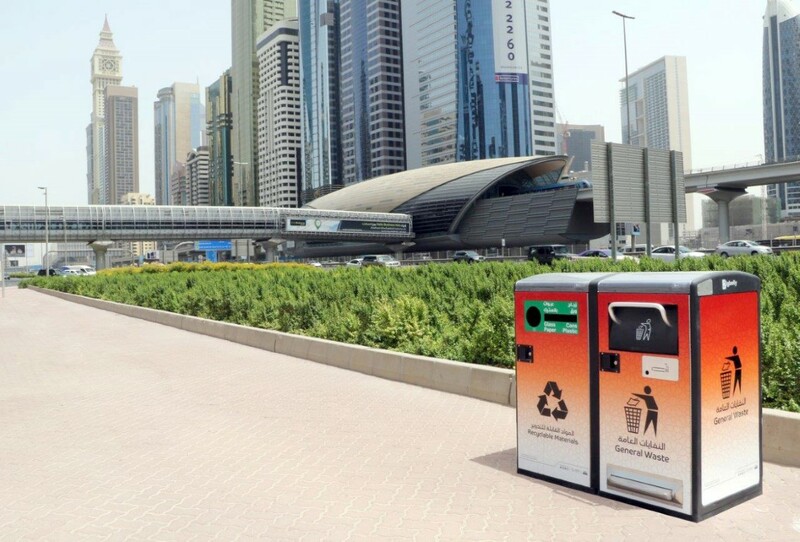 The Waste Management Department of Dubai Municipality has distributed 100 environmentally-friendly smart containers for waste storage along both sides of Sheikh Zayed Road from Dubai World Trade Center roundabout to the first Interchange linking the bridge on Safa Street and Financial Center Street as a first phase to encourage waste separation and increase the efficiency of recycling programs in the area. The move is part of Dubai Municipality's keenness to adopt best practices to enhance the quality of sustainable life in Dubai. Eng. Abdulmajeed Saifaie, Director of Waste Management Department and Head of the Sustainable Waste Management Awareness Team at Dubai Municipality, said that the distribution of new waste storage containers comes in line with the most successful international standards in the field of improving public cleanliness in the emirate. "The smart containers are designed to the highest and the best quality standards approved in the field. They are solar powered and equipped with electronic devices and high-precision sensors to monitor and measure the level of waste. When the container is full it reports by sending an instant signal to the control center to carry out the unloading when needed. The innovative containers also contain two separate openings, one for general waste and the other for recyclable materials such as glass, packaging, plastic, paper etc.," he said. Saifaie said the distribution of smart containers comes in support of Dubai government's plan to transform the emirate into the world's first smart city and to complete the modernization and development of all waste storage systems in Dubai in line with state-of-the-art technology solutions and the finest clean technologies. On the expected positive results, he explained that the use of these containers has several environmental benefits, including reducing carbon footprint and improving environmental impact. "It helps to reduce harmful carbon emissions and rationalize the consumption of electric power as the containers depend on 100% on solar energy for their operation. [The smart system leads to] improving the operational efficiency of waste collection, storage and transport services by 80%, enhancing the optimal use of resources and efficiency of field performance in various areas of the Emirate of Dubai," said Saifaie. As for the technical specifications and advantages of these containers, he said that they have been equipped with intelligent techniques for the authorities to monitor the geographical distribution, storage and operation of waste storage means in the Emirate of Dubai. Saifaie pointed out that the automatic waste compression feature available in the container will increase the capacity of the container, which is about eight times greater than the regular containers distributed in the city with a capacity of 85 liters, thus reducing the number of reports and complaints about the accumulation of waste in the public streets. "In addition to that the sealed design of the container prevents insects and rodents attracted to it, and thus it mitigates the negative impacts on health and environment and the general aesthetic appearance of the place. The outer structure of the container enables it to be used for spreading awareness and education messages directed to all segments and groups of the society," he said. Located in the UAE? Please contact Gulf Solartech to discuss the opportunity to deploy a smarter solution for public space waste management... Phone: 971 4 388 4744, or Email: info@gulfsolartech.com.